Within the Settings area of Microsoft Dynamics CRM, you are able to set up the OpenMoves email accounts that are to be used for sending emails, control the timings of automatic synchronisations between OpenMoves and Microsoft Dynamics CRM and create custom data labels. These are administrative functions and should only be accessed and edited by the Email Campaign Manager. Data labels can also be referred to as data fields; the two terms are interchangeable. In both Microsoft Dynamics CRM and OpenMoves you are able to create any data labels you wish according to the information you want to hold about your contacts. This enables you to capture and retain additional information about your contacts which you can then use to search across your data and to create targeted campaigns. You can create as many custom fields as you wish and when created the custom data field is added to all the address books in your OpenMoves account. Data labels created are not personal to the user who created them; they are available to any user accessing the account. To access this functionality, select Settings from the menu bar, and then select Email Accounts. This screen displays the OpenMoves email accounts that have been set up for use with Email Campaigns. You can create as many email accounts as you wish which can have multiple campaigns linked to them. However an Email Campaign is only ever linked to a single email account. Step 1: Click New on the Email Accounts screen. A blank Email Accounts Information screen is displayed. Step 2: Complete the fields on the General tab, selecting an appropriate and recognisable name for the account. Step 3: Complete the fields on the Administration tab. The Owner field will default to the currently logged in user but is editable. Information for the Connector Key field is obtained from OpenMoves during system set-up. Step 5: Click Save and Close. The Email Accounts screen is displayed and the new record appears in the table. 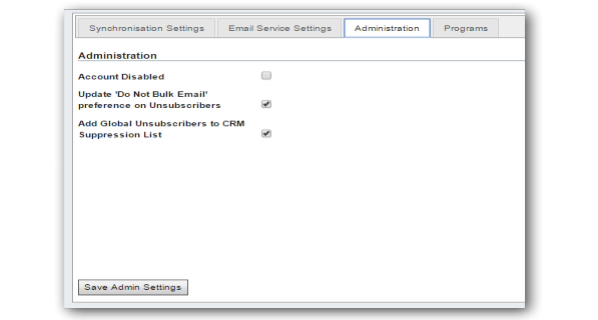 Step 6: Click on a record to display the Email Account Information screen. To access this screen, click Settings in the menu bar, then Emails Accounts to display the Email Accounts screen. Click on the record you wish to view. The screen is divided into a number of tabs. The main toolbar at the top of the screen contains an Email Settings button which is used to control the timings of automatic synchronisations. The menu can be used to view further information about the email account. Clicking an option in the menu bar refreshes the main body of the screen. The main toolbar also contains two buttons that allow the setting up of the User mapping for the Automation Studio and also a test button for the Automation Studio. This tab displays the email Account Name and Description. Displays the email account Owner and Connector licence key. Displays all CRM fields for each of the entity types in the CRM system. The displayed data can be filtered by entity type or searched upon. Clicking on a record displays the CRM Field information screen. The CRM fields displayed can be used for mapping to OpenMoves data labels. Displays the main screen with General, Administration and CRM Fields (Global) tabs. Displays all marketing lists which use the selected email account. Displays all Email Campaigns which use this email account. Displays all email send batches that have been sent using this email account. Displays a list of all targets that have been mailed from the selected email account. Displays all email clicks across any campaigns which use this email account. This section displays all OpenMoves data labels that appear in your associated OpenMoves account. Click on a row to display the Email Data Label Information screen. New data labels can be created from this screen by clicking the New Email Data Label button. When the next synchronisation with OpenMoves takes place, your new data labels will be created in OpenMoves. You can also create new labels in OpenMoves and the synchronisation process will bring them across to Microsoft® Dynamics CRM. The Synchronise Data Labels button can be used to perform an immediate synchronisation with OpenMoves. For more information about data labels and how they are created and used, see the Data Labels and Data Mapping section. This section displays mappings between CRM data and OpenMoves data labels. You will need to create all required mappings upon initial system set-up. Click on a record to display the Email Data Mapping Information screen. For more information about data mapping and how they are created and used, see the Data Labels and Data Mapping section. Displays targets who have unsubscribed from a specific marketing list associated with this email account. Displays email addresses that are being suppressed for various reasons such as bounced, global unsubscribe, a complaint to an ISP etc. This functionality is reserved for future use. This displays a table of synchronisation types and the synchronisation schedule for each, together with the Last and Next Synchronisation. Clicking on a field displays a pop-up window allowing the synchronisation schedule for this type to be edited. Immediate Synchronisation is also possible. CampaignStatistics - Refreshing of behavioural data from OpenMoves to Email campaign. MarkeingListDataOut - Synchronisation of CRM Marketing list data to OpenMoves address books, (this will also include datain when mapped). DataLabels - Update the OpenMoves Email Data Labels in cache. SupressionList - Initially synchronisation of the CRM suppressed contacts to OpenMoves followed by OpenMoves suppressed contacts to CRM UnSubscribers Remove from the marketing list and create a list of suppression records against the person and marketing list. CrmMetadata - Update the CRM fields in system cache and the data structures. Forms - Refreshing Forms data from OpenMoves to Email campaign. WebInsight - Refreshing WebInsight data from OpenMoves to Email campaign. The information required for this tab will be provided to you by OpenMoves as part of your set-up procedure. 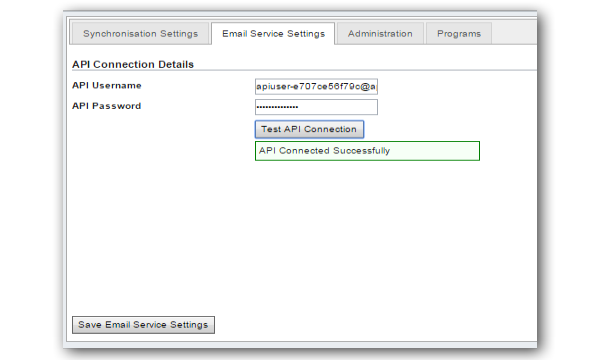 The Test Connection button is used to test connectivity to the OpenMoves API. Use the Save button after any alterations. This tab allows the certain administrative tasks to be undertaken, this includes the disabling the current Email Account. The option to “Update the Do not Bulk Email” is used to control if this field is updated from OpenMoves during synchronisation (Default is On). The option to “Add to the CRM suppression list” is used to control if email addresses are added to this internal Dynamics list (Default is On). This tab controls how any Automation Programs that are present in the Connected Email Account can be used. The left hand panel shows all the active and inactive programs, only active programs can be selected, these then appear in the right hand panel and will be selectable from the contact/lead record. When only mapped users are to be allowed to use the Automation program feature, the “Mapped Users Only” option should be checked. When no programs have been selected the interface from the Contact/Lead records will show the following message. This button is used to map the OpenMoves users to Dynamics users for each connected account. If no users have been mapped and select the Automation Studio, this screen will be displayed. The initial screen shows all the OpenMoves account users on the left hand side, the main account user is highlighted. From the dropdown list, select the Dynamics user to be mapped. 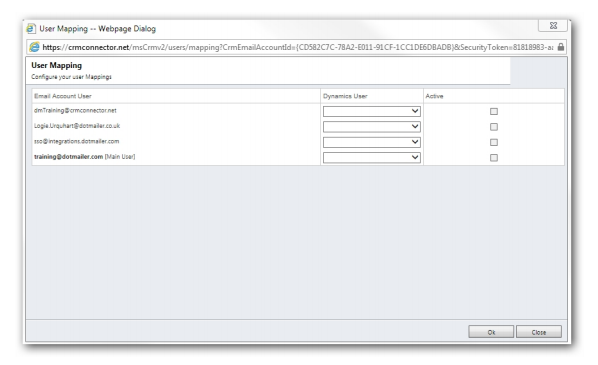 All users that require single sign on access to OpenMoves from Dynamics. How do I assign the appropriate privileges to the users who will need to use OM3 for Microsoft Dynamics? (1) The ‘Email Marketing Manager’ role enables a user full access to manage and send campaigns from CRM. (2) The ‘Email Marketing Professional’ role is the same as the Email Campaign Manager role with the exception that this role cannot execute an Email Campaign from within CRM. (3) The ‘Email Marketing Viewer’ role can view Email Campaigns and related information but cannot change settings or execute Email Campaigns from within CRM. Please note that these roles are required in addition to the basic security roles, so the user must also have an existing CRM role with access to Contacts, Leads, Accounts, Marketing Lists and Campaigns such as Marketing Manager, Sales Person, etc. This option enables any mapped user to directly enter OpenMoves from within Dynamics. This then allows the user to create campaigns, automation programs, manage contacts and use all of the OpenMoves functionality, without ever having to leave Dynamics CRM. The first time you try to use the Automation Studio, you should be presented with a login screen as shown below. Enter your user name and password. The access provided by this window will be exactly the same as if you had logged in directly. You may be required to verify your location. If the following screen is displayed, you will need to contact your CRM manager to resolve the issue. One of the most powerful features of the integration between OpenMoves and Microsoft Dynamics CRM is the ability to map pieces of information between CRM attributes and OpenMoves data labels. This ensures that as information changes within CRM that information is available for use within your Email Campaigns to personalise your message, such as salutation, an accounts manager’s contacts details, etc. and also to drive any dynamics contents your message may contain, such as hiding or showing email content based upon gender or a known product preference. Custom data fields can be added to address books to capture and/or contain additional information about your contacts. The more useful data you can collect on your contacts, the more you can segment, target and personalise your campaigns and generate better response rates. For an Enterprise account you can have up to 394 custom data fields that you can create and when you create a custom data field it is available throughout your OpenMoves account. To access Email Data Labels, select Settings from the menu bar, and then select Email Accounts. Choose the account you wish to work with and click it. Select Email Data Labels from the menu bar. Step 1: Click on the Add New Email Data Label button on the Email Data Labels screen. A blank Email Data Label Information screen is displayed. Step 2: Complete the fields on the screen, giving the new data label an appropriate and unique name. i) ‘Is Private’ - New labels are always created as ‘Private’ in Microsoft® Dynamics CRM – you can change this to ‘Public’ if you wish using OpenMoves. ii) ‘Default value’ - You can enter a default value for the data field in the event that it is not populated as a result of the uploading of your data. For example, if this was a Salutation data label where the First Name would usually be entered you might default the value to “Customer”. If some of your records do not have first names held, “Customer” will then be automatically entered rather than leaving a blank field. iii) ‘Description/Purpose’ - If you wish, add some notes to the Description/Purpose field to explain the intended usage of the data label. iv) ‘Email Account’ - The Email Account field will show the email account that you originally navigated from but can be edited. Step 3: Click Save and Close. The Email Data Labels screen is displayed and the new label appears in the table. To access the Email Data Labels Information screen, select Settings from the menu bar, and then select Email Accounts. Choose the account you wish to work with and click it. Select Email Data Labels from the menu bar. Click on a record. This tab displays basic details for the data label. The ‘Is Synchronised’ radio button indicates whether the data label has been synchronised with OpenMoves. Displays the General tab. See screenshot above. Displays the mappings for the selected data label and allows new mappings to be added. Click a record in the table to view the Email Data Mapping Information screen. To add a new data mapping, click the Add New Email Data Label Mapping button. To access Email Data Mapping, select Settings from the menu bar, and then select Email Accounts. Choose the account you wish to work with and click it. Select Email Data Mappings from the menu bar. To avoid creating duplicate mappings, you should always create a mapping from a Data Label Information screen rather than the screen displayed above. This allows you to check existing mappings for a specific data label and confirm that the mapping you require is not already in place. Step 1: From the Email Account Information screen, select Email Data Labels from the menu bar. Step 2: Select the data label you wish to work with from the table. Step 3: From the Email Data Label Information screen now displayed, select Data Mappings in the menu bar. The screen will display any existing mappings for the data label. Step 4: Click on the New Email Data Mapping button. A blank Email Data Mapping Information screen is displayed. The Email Data Label and Email Account fields will have default values already entered. Step 5: Complete the Mapping Direction. Step 6: Complete the Mapped Entity field. When this has been selected, the Primary CRM field becomes active. Similarly, when the Primary CRM field is completed the Linked CRM field shall become active if appropriate. Please note: When using a Linked CRM field, it will remain locked unless the Primary CRM field is a lookup field to the object that is being linked to. Step 7: Click Save and Close. The Email Data Mappings screen is displayed and the new mapping appears in the table. To access Email Data Mapping, select Settings from the menu bar, and then select Email Accounts. Choose the account you wish to work with and double click it. Select Email Data Mappings from the menu bar. Click on a record. Displays basic details for the data mapping. This section displays the General tab.